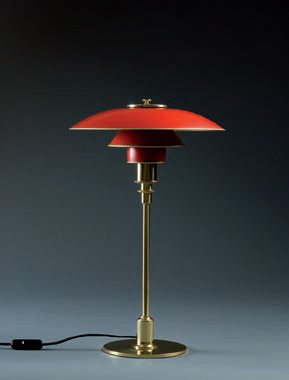 As early as 1924 Poul Henningsen developed a series of lamps with several shades mounted one above the other. The purpose of this design was to shield the strong light of the bulb to avoid glare. 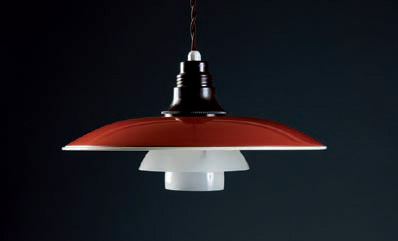 Already the same the year Poul Henningsen began to make lamps for Louis Poulsen. This developed into a very long and fruitful collaboration. The name PH 3/2 refers to the size of the shade set. PH 3/2 is one of the most common sizes, but sizes vary from 1/1 to 6/6. It is said that Poul Henningsen’s inspiration for the shade form of PH 3/2 came from a stack of china, where a cup, a saucer and a bowl were stacked on top of each other. 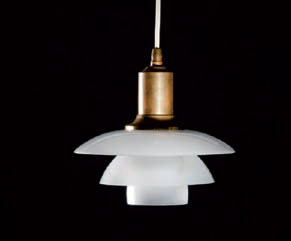 The elegant shades in PH 3/2 come in opal glass and lacquered copper, etc, and emit a soft light. Pictured here is a more recent anniversary version of PH 3/2 from the 1980s, after the original from the 1930s.